BLAEU - Provincia autore Petro Johanne Bompario Provence. BLAEU, W. and J. - Provincia autore Petro Johanne Bompario Provence. Provincia autore Petro Johanne Bompario Provence. - BLAEU, W. and J. 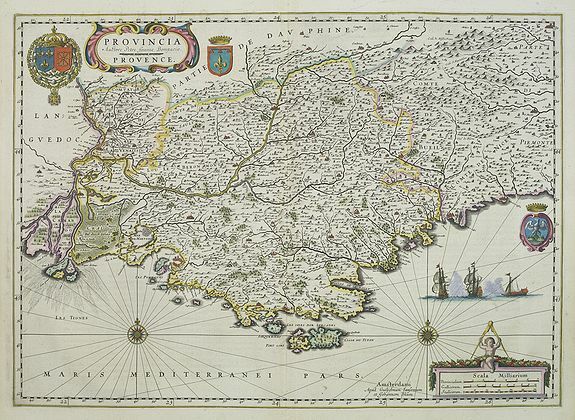 Title : Provincia autore Petro Johanne Bompario Provence..
Map maker : BLAEU, W. and J.. Size : 15.2 x 21.2 inches. / 38.5 x 53.8 cm. Description :A very decorative map, several cartouches, prepared by Pierre Jean Bompario. In this region over half of the rosé wines produced in France is from the Provence region. Rosé de Provence are dry and fruity.